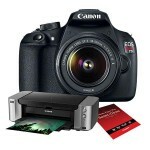 Adorama.com has Canon EOS T5 Digital SLR Camera w/ 18-55mm Lens + 75-300mm Lens + Pro-100 Printer + 50-Pack Photo Paper for $708 – $350 rebate = $358. Shipping is free. Designed for first-time DSLR users on a budget, the Canon EOS Rebel T5 has an easy-to-use interface and a help guide that holds the hands of novice users through the picture-taking process. It’s the least expensive way to gain access to Canon’s legendary lineup of EF and EF-S interchangeable lenses, ranging from ultra-wide-angle to super telephotos and macro. Canon Rebel T5 Key Features: • 18.0 Megapixel CMOS (APS-C) image sensor • High-performance DIGIC 4 Image Processor • Full HD Movie Capture up to 1080p at 30fps • Scene Intelligent Auto • Feature Guide offers short descriptions of shooting modes, settings and effects • Continuous shooting up to 3.0 fps • 3-inch LCD, 460k pixel resolution LCD • ISO 100-6400, expandable to 12800 • 9-point AF system (including one center cross-type AF point) • AI Servo AF • Creative Filters including Toy Camera, Fisheye and Miniature Effect • Advanced imaging features like Basic+ and Creative Auto. • Compatible with the full line of Canon EF and EF-S lenses.